Folks from Medill’s Spiegel Research Center, led by research director Edward Malthouse, analyzed 13 terabytes of anonymous reader and subscriber data from the Chicago Tribune, Indianapolis Star, and San Francisco Chronicle. 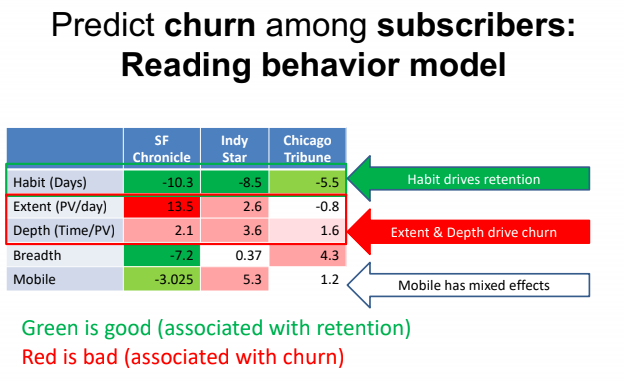 In doing so, they were able to “trace anonymized, individual behaviors of people who kept and cancelled digital subscriptions.” The team had about a year of data from the Chronicle, nearly three years of data from the Tribune, and a little over two years of data from the Star. Main image CC-licensed by Unsplash via Waldemar Brandt. This article was originally published by Nieman Lab. It was republished on IJNet with permission.